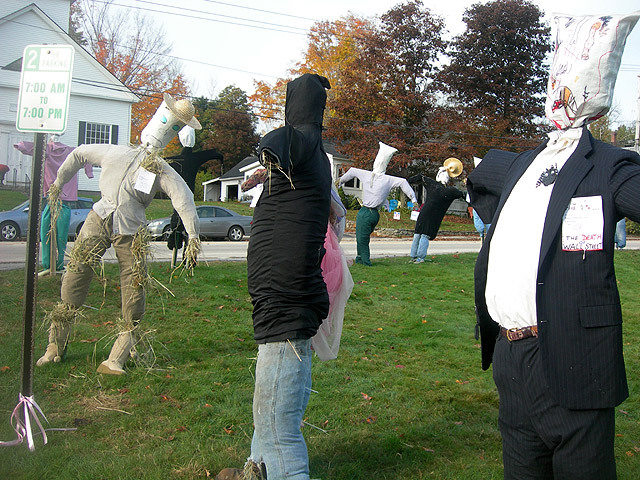 Invasion of the Scarecrows! | Dinosaur Dracula! Imagine my luck! 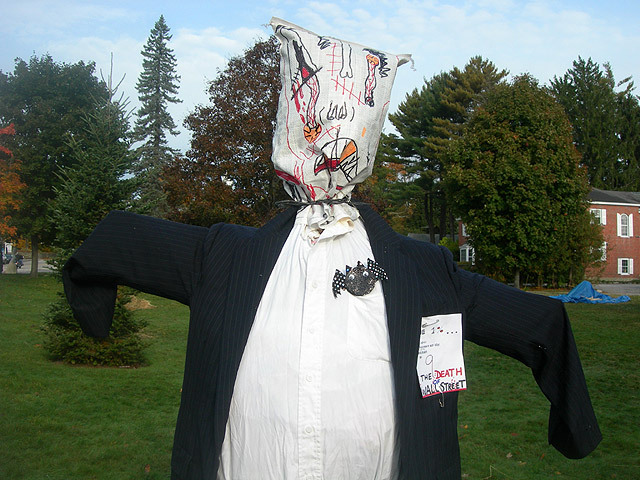 On the exact weekend that I go to New Hampshire, New Hampshire gets invaded by hundreds of insane scarecrows. 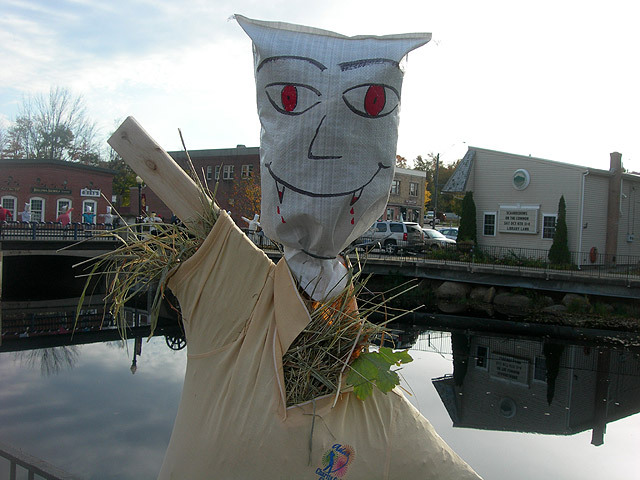 The Scarecrows on the Common event occurred in the city of Jaffrey, and God, they are FOOLS if this isn’t in their tourist brochure. I know you’ll think I’m exaggerating, but I’m not. This wasn’t just like, a random field full of scarecrows. It wasn’t even a couple of streets’ worth of scarecrows. There were scarecrows EVERYWHERE, seemingly for miles. Not shown: TEN TRILLION MORE SCARECROWS! They were amazing. I know I call everything amazing, but this time, I mean it. 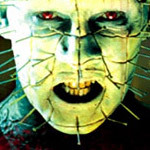 From what I gathered, the creation of these beasts was a town-wide event, where citizens of all ages picked from piles of old clothes to fashion scarecrows that were insanely unique and just plain insane, birthed from the darkest, most drug-worn portions of their demented brains. 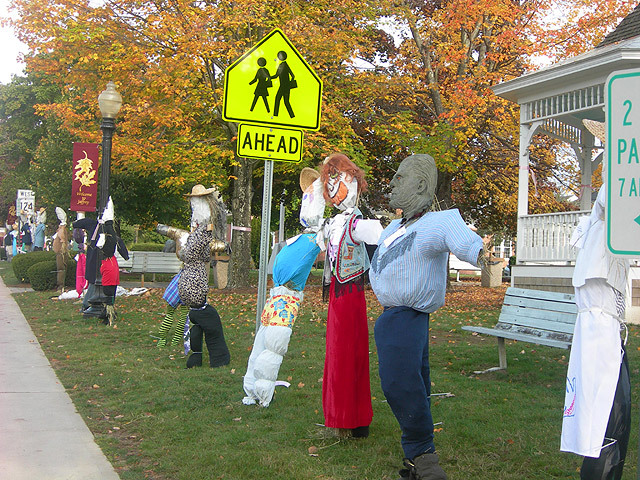 Some of the scarecrows were the obvious works of children. Others had too “mature” a slant for that. Then there were several that could not have come from any human mind, seeming so out of this world that I still sit here clinging to these photos as my beloved proof that this actually happened and wasn’t just a bizarre dream. I can already tell that I’m writing like someone who doesn’t know how to. That’s the sad byproduct of being more excited than I’ve ever been before. I’m too giddy to make sense. Ocean paper, and box seven dove. Walking those streets was heaven and hell, all at once. It was even stranger to do so early in the morning, when I seemed to be the only (breathing) person in the whole town. Just me and a million crazy scarecrows. Thank you, camera. Nobody would believe my story without you. I’m sorry I got you covered with all that corn syrup. I guess it was a competition? I bet first prize was mulled cider and a frilly ribbon. 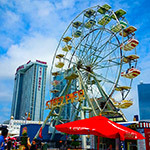 In my view, they were all winners. 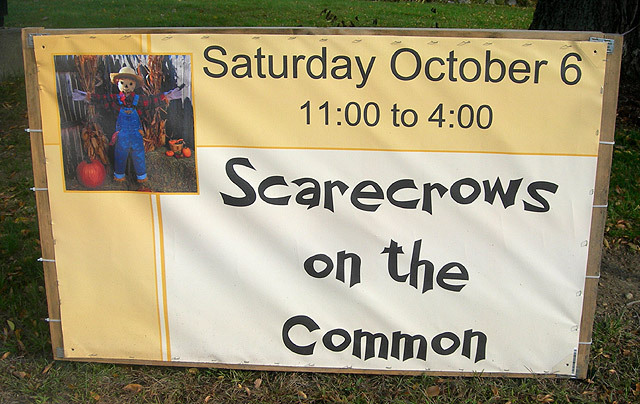 I didn’t see a single scarecrow that wasn’t worth a picture. And thus I am now the proud owner of 500+ scarecrow photos. Shrinking that number for a reasonably-sized Dinosaur Dracula article was no easy task. After serious debate, I’ve narrowed my collection down to the 40 best scarecrow photos. Let’s begin with my favorite 5. Or at least, 5 of my favorites? It’s too hard to rank these. 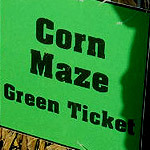 No matter which scarecrows I pick, I feel like I’m doing too many others a disservice. 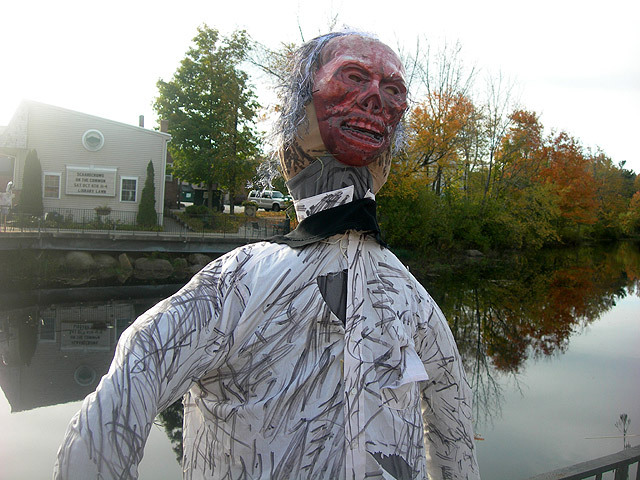 Red Zombie: Many contestants used Halloween masks with their scarecrows, but this one was especially great. 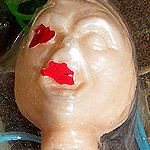 A red zombie mask with old man hair. Then they went an added a torn work shirt with random lines drawn all over it. It was hardly the biggest production of the scarecrow invasion, but everything about it just clicked. He looks like a party animal and a festering killer. Only Red Zombie could pull off being both. Dracula in a Golf Shirt: I’m not picking this one because it itself is so phenomenal; it’s just that Dracula in a Golf Shirt best exemplifies the overall spirit of the scarecrows. 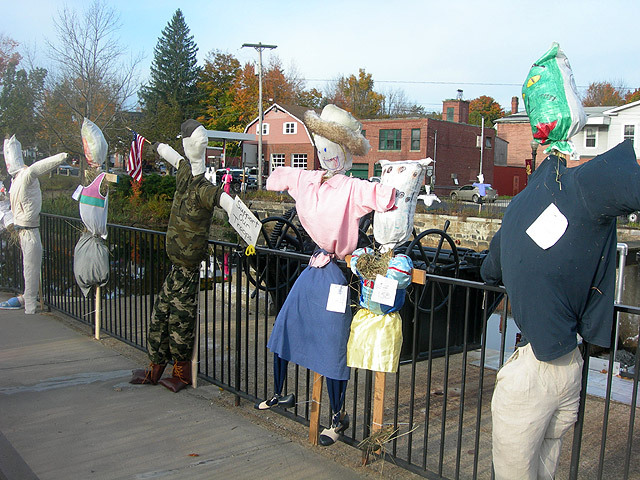 As I understand it, the town ran a clothing drive for the materials, so the participants built their scarecrows with the sorts of weird clothes you’d find in a dingy thrift store. The fact that this vampire dons a golfing t-shirt is so much better when you realize that it was done with zero ironic intent. Also note the upside-down sack head. Most of the scarecrows had heads just like that, with the faces crudely colored on. You know you’ve found a special place when Dracula in a Golf Shirt is the clearest example of the everyman. 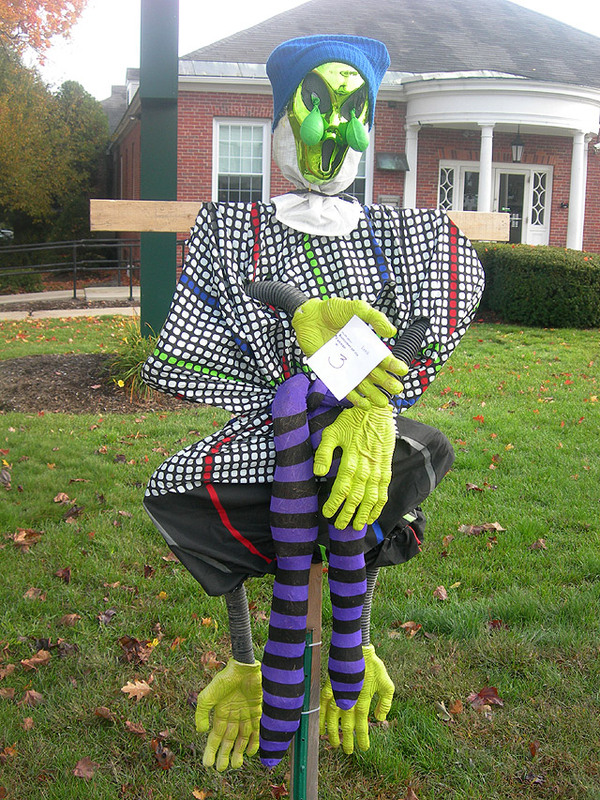 Alien Freakshow: Some of the scarecrows, like this one, were way too weird to have happened by accident. These scarecrows could only have some from the city’s underground artists, who sprung from the sewers after hearing that anyone who made a scarecrow was gonna get free pizza. With a slice of pep in one hand and four springy Frankenstein arms in the other, some graying beatnik created this gorgeous thing. All I’m certain of is that it has balloons growing out of its eyes. Everything else, including the simple number of legs, is open to interpretation. The more I look at it, the more things I see. I see an alien. I see a witch. I see a funky rapper from 1991. It’s the scarecrow version of an ink blot test. Sequel Leatherface: Ah, man. This one is great. I’m gonna assume it was made by a boy in the third grade. I was a boy in the third grade once, and this is exactly the kind of scarecrow that I would’ve created. His face is a vile mess of drooping eyeballs and bloody scars, and given the outfit and rotundness, he looks a bit like “Sequel Leatherface” from The Texas Chainsaw Massacre 2. You know, the one who humped his chainsaw in a misguided show of affection for DJ Stretch. And yeah, I’m willfully ignoring the political commentary on his little nametag thing. Kinda kills my third grader theory. I’m a Keeper: Wicker hat? Check. Enormous mouth, lined with bloodied, stalactite-like teeth? Check. “I’m a Keeper” t-shirt, in faded red, with a monkey on it? CHECK, PLEASE. This odd scarecrow event was honestly among the best “Halloween things” I’ve ever seen. We could never pull off something like this where I live; those scarecrows wouldn’t last a night, let alone days. Hell, even when I see one lone family set up one decent scarecrow in their front yard, I freak. But this was HUNDREDS of scarecrows, covering MILES of ground. Even the McDonald’s had fourteen monsters in front of it. One of them looked like a ninja! My only regret? It would’ve been so easy to steal a few. Maybe I should’ve. Conscience be damned: I could be sitting next to “Alien Invasion” right now. 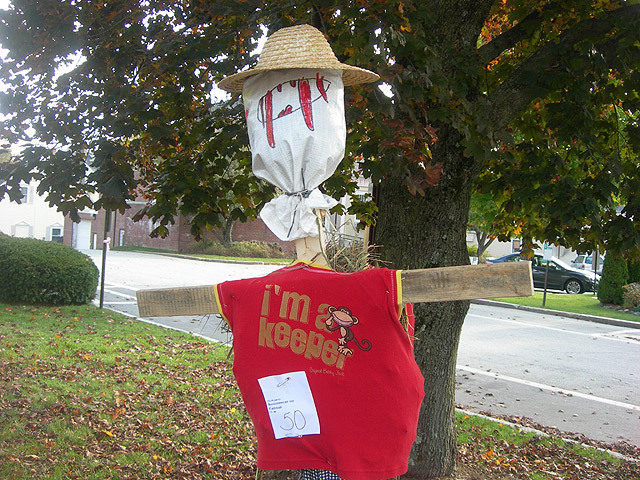 On the next page are 35 more of Jaffrey’s best scarecrows. 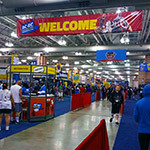 I’ll end my commentary here, because the photos speak for themselves, and I’m tired of writing about scarecrows anyway.